Video content should be part of your content strategy if it isn't already as people really like it and it can be easier to rank video content for competitive keywords than 'normal' content when video results are incorporated into the SERP. I wanted to share some tips from my experience. If you have other tips, drop a line in the comments and share! Ok, that's not always true. YouTube is a good source of getting views for your videos as it is the second largest search engine, but it isn’t always the best place to host your videos. If the keywords you are targeting cause video results to turn up in the search results, then you should not host the video on YouTube, rather, host it on your own site. An additional consideration is that YouTube views rarely turn into website traffic. If your main goal is to drive more traffic to your website, you should host the video on your own site. If you want the video on your site instead of YouTube, you don’t have to host yourself. There are many video hosting services out there, like Wistia, that will not only let you embed the video (as YouTube does), but they go further and provide you with a video XML sitemap, attributing ownership of the video to your site. If you want the video on your site rather than YouTube, create a video XML sitemap and submit it in Google Webmaster Tools. This will help Google to discover this content (but it won’t impact your rankings). If you use a service like Wistia, they will generate a video XML sitemap for you that you can submit. If you want to make your own, here are some things to keep in mind. If you are putting the video on YouTube or Vimeo, you will have to use the URL for the player location rather than the URL of the raw file location. Further, if you are putting your video on YouTube or Vimeo, you should still provide a video sitemap as this will provide more meta data for the video. Additionally, keep in mind that an XML sitemap can only have 50,000 entries. There are additional tags that can be included in a sitemap (and you should include as many as possible) – Google provides documentation of these here. While this doesn’t really show you how many people are searching for terms, it can help you come up with some ideas. If you are hosting the video on your site, use your normal keyword research tools. As Google can’t determine the content of a video like they can do for a blog post, Google won’t really know the content of the video unless you tell them exactly what’s in it. The solution is to transcribe your videos and put the content below the video. Videos that are exported in HD tend to perform better than those that aren’t. YouTube won't know the difference between a video that is filmed in HD and one that is filmed in SD and simply exported in HD. That in mind, it is really important to make sure it can scale from 1920 x 1080 down to the actual player size. There could be a lot of factors playing into this but as a best practice, you will want to film (or export) in the highest quality possible. This is true for both videos that you put on YouTube and host yourself. 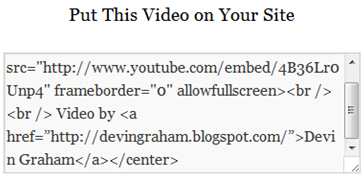 Sure, you can provide your users with the embed code that Wistia or YouTube gives you. Or you can edit it so that you get a link out of it. If you have a fancy Wistia account (super embed) or Vimeo Pro, you can edit the embed code so that it will incorporate any links that you need for your optimization efforts. Like any link bait that you release, your video should have a good headline. Instead of rephrasing what is already written, I will recommend that you read Magnetic Headlines.